I have to admit I really had to think about this message after I received it. But now that I have, I have to admit I love it. We are being told that our destiny is part of our evolution to our perfect oneness with ourselves, nature and God. Yes, we come with our destiny imprinted on our soul and at some level we know it. But here is the special part of today’s message. We are not walking TO our destiny. We are walking IN it. 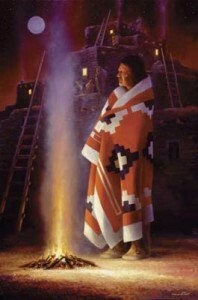 We are wearing it like an old Native American blanket or quilt woven with our past lives. It cloaks us in comfort and knowing because it carries all we were before….including all we learned and knew. And we are now adding to it. Isn’t that a great message for us? Doesn’t it just fill you with HOPE? -Meditate…remember that you are enough. You have everything you need. -Get outdoors and take in at least ten deep breaths. It occurs to me as I look at huge snow flakes fall, it will be easier for some of us than others today. -Think about it. What are some of the things you know….you have just always know…..or suddenly you remember? Those are the things that are woven into your DNA….blanket. Don’t question it. Don’t judge it. You don’t have to justify it. It just is. Wear it proudly. -Lots of tasks completed….not all….but a lot. -A great trip to Stillwater.